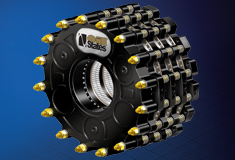 Only Oil States CoolForce brakes offer a removable composite water jacket insert to reduce life-cycle costs by simplifying field maintenance and rebuilds. The replaceable insert also eliminates corrosion resulting from contact of the copper backing plate with the cast iron supporting structure inside the water jacket. The CoolForce brake offers a high-torque rating and thermal performance against the traditional water-cooled brakes, but their innovative, composite-jacket insert design eliminates time-consuming weld repairs and re-machining of the interior features of the water jacket.